His “Dream of the Rarebit Fiend” cartoon was adapted forfilm in 1906. Its success inspired him to think about producing such work himself. 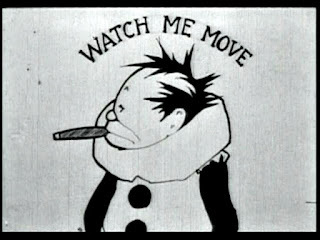 McCay touted himself as the first animator, but Emile Cohl and J.Stuart Blackton, the latter of whom filmed the live-action portions of this movie, preceded him. McCay’s innovations were aesthetic and technical. His solid, fluid blocks of composition were ready-made for transfer onto film. Working in comic-strip sequence prepared him mentally for learning how to push action across a page in the service of a story. For centuries, informal “flip books” made pictures move when you thumbed them rapidly; McCay figured out the same effect worked on film – one frame per page. The move toward cel animation, patented in 1914 by Earl Hurd, had begun. The film opens with McCay and three of his artist friends at cards in their club. The others are John Bunny, the popular early silent comedian; George McManus, the cartoonist who created “Bringing Up Father”; and matinee idol Maurice Costello, great-grandfather of Drew Barrymore. Like Phileas Fogg in Verne’s Around the World in 80 Days, he wagers that in one month he can create a moving picture out of 4,000 consecutive drawings, using characters from his “Little Nemo” strip. McCay, as a former quick-sketch artist, has enough of the performer in him to make this short film work. A little vaudeville sequence takes place next. Bundles of drawing paper and barrels of ink are trundled into McCay’s office, where he sits scratching out his work. The process is illuminated when we see McCay checking the flow and continuity of his drawings on a desk-top Mutoscope, a primitive hand-cranked flip-card moviola invented by Herman Casler in 1895. There’s a little comic byplay as an office boy knocks over McCay’s piles of papers. McCay mounted his drawings on cardboard. He shows us his hand slotting the first panel into a wooden stabilizing frame; it’s easy to make out the registration marks at the corners of each panel that ensure that the motion coheres. Jip and Imp cavort in empty space. The figures have roundness, and move convincingly, but drawn without background, they cavort like weightless beings. It foreshadows for a moment he vagaries of being cut free from background and context in the 1953 Warner Brother s cartoon "Duck Amuck." Nemo materializes, then seems to control his sidekicks as they swell, thin, and contort beside him. Nemo then draws his princess, bringing her to life. A giant rose manifests; Nemo plucks it and gives it to her. They climb onto a throne in the mouth of a friendly dragon and fly away. Jip and Imp attempt to follow in a jalopy, but it explodes and they end up falling on the head of yet another character, Dr. Pill. The prolific McCay’s top-notch drafting and storytelling skills, along with his penchant for the fantastic, would affect animators and illustrators from Disney to Sendak. “Little Nemo” is a dry run, a glimpse into the possible.